If it’s Saturday night on SyFy, it can mean only one thing: giant bugs! Or giant snakes. Or giant sharks. Or giant weasels. Or normal-sized weasels with giant delusions of grandeur. 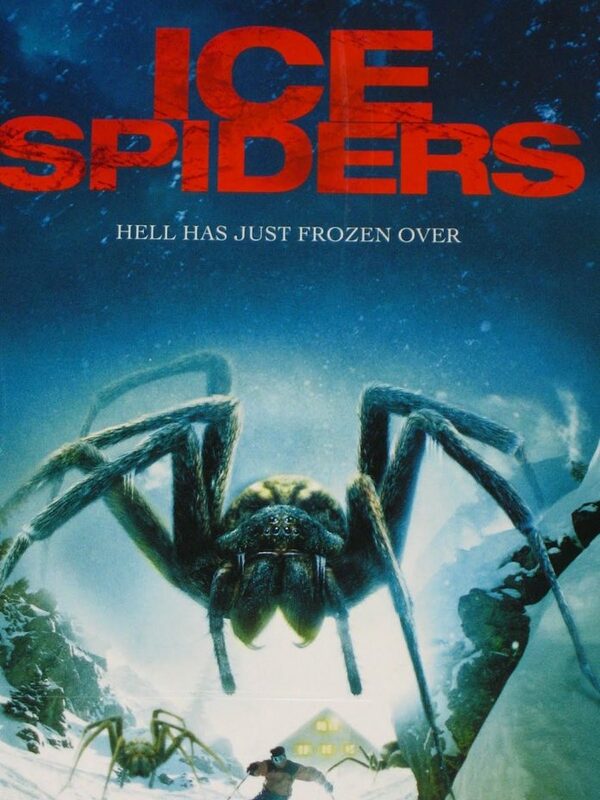 But Ice Spiders stands out from the pack not for its creature content, but rather because it features a black heroine. Black heroines are hard to find in any genre — unlike black tar heroin, which can be had outside any local 7-11 — but in horror, where being black carries the stigma of having a target painted on your back, it’s particularly refreshing. Vanessa Williams, not to be confused with Vanessa L. Williams (the “L” standing for “Look, I’m naked in Penthouse!”), co-stars as April Summers, a scientist in a secret alpine military base working to splice prehistoric spider genes into modern-day spiders in order to produce super-strong spider silk for bulletproof body armor. Unfortunately, she doesn’t plan adequately for the super-strong spiders that are the byproduct. Although the snowy wilderness was supposed to prevent the spiders from escaping the base, they get over that whole cold phobia real quick and set their sights on the neighboring ski lodge. April manages to escape and warns the lodge’s local ski stud, Dan “Dash” Dasiell (Patrick Muldoon, whose red, leathery skin and perpetual bedhead don’t appear to be courtesy of the makeup department) and ski coach Frank Stone (Stephen J. Cannell, who inexplicably had nothing to do with the writing or production — meaning he was hired for his “acting ability”?). Fortunately for us, though, she doesn’t prevent many of the irritating characters from getting killed — including the requisite evil scientist who wants the spiders unharmed. 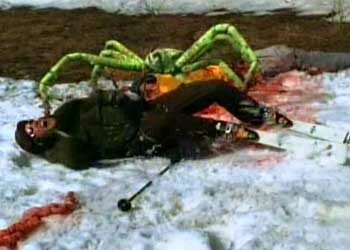 The kills aren’t spectacular, but they’re fun enough — including a spider coming down a chimney and another intercepting a skier in mid-jump — for a movie that doesn’t try to be anything more than it is: a poor man’s Eight-Legged Freaks. It’s a beer-and-friends movie that should be laughed at and forgotten; slightly above-average entertainment value for a Sci-Fi Channel film, although the poster is still probably the coolest thing about it. 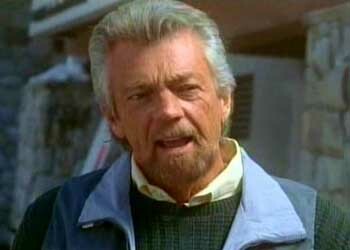 Tibor Takacs, who’s also brought us such “classic” SyFy animal features as Killer Rats, Kraken: Tentacles of the Deep, Mega Snake and Mansquito, probably directed this film in his sleep — which would explain computer effects that at times seem straight out of a DeVry video game design commercial. It’s good to see Williams in a role more glamorous than her most famous horror part — the Cabrini-Green baby mama in Candyman — and one in which she’s actually treated as a woman and a love interest for the hero, even one as rubbery as Patrick Muldoon. 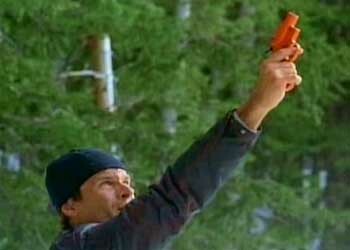 It’s also relaxing to watch a horror movie knowing that the black person probably isn’t going to die, so when she goes running off to save some random person from a mutant spider, wielding nothing but a ski pole, I can laugh, knowing there aren’t any Charles Dutton “Save yourself!” moments to be found. 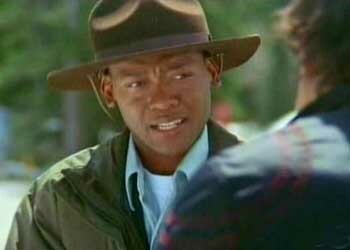 This doesn’t mean that Ice Spiders is free from black death, however; K. Danor Gerald’s role as Ranger Rick serves to remind us why black people don’t get jobs as forest rangers. The Flare Gun of Greyskull was much less impressive than the sword. It was inevitable that Otto would pay for not wearing his bulletproof pants.